My Family Fun - Band in a Box Encourages kids music appreciation and ability. By Melissa & Doug. Encourages kids music appreciation and ability. By Melissa & Doug. This whopping 10-piece instrument set is full of favorites guaranteed to bring hours of musical joy, all conveniently packed in a sturdy wooden storage case! 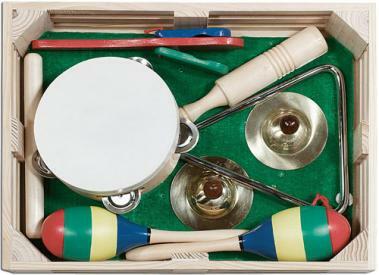 Included are a triangle, maracas, mini-cymbals, tambourine, clapper and wooden percussion stick. Box measures 15" x 11" x 3.5". Ages 3 and up By Melissa & Doug.